The prize winning compositions selected for performance this year are quite concentrated, totalling only about 40 mins for the four, but they are all interesting enough that we have watched the disc twice straight through. We enjoyed especially the Japanese Takahiro Sakuma's Against the Current for deciding on "sound that I favour myself without any trendy techniques". 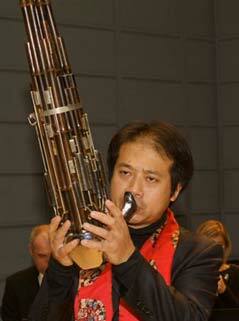 And for fullest exploration of the exotic instrumentation prescribed, tiny Pui-shan Cheung's Chi'en III was a delight. Not for me to put them into starring order, and I hope that the financial and promotional rewards are judiciously shared amongst all the meritorious young finalists? Wengler & colleagues have gone in for Eeastern countries' takes on orchestral music. It is good that the recordings are now on DVD - this worth-while music is all very "visual". For the future, I would hope that shots of the audience will be included, to give a better feel of the actual event? Since then we have received CDs of prize concerts from that source regularly, q.v. http://www.musicalpointers.co.uk/reviews/cddvd/lux2004.htm. Last year's was perhaps the most innovative of them all, and celebrates the Chinese sheng - probably the best known of all the Asian free reed instruments - in a Western contemporary context. 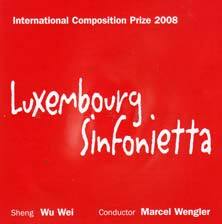 The versatile Luxembourg Sinfonietta commissioned the chosen works to be played by Wu Wei (pictured) and all were given at this concert, headed by Americ-based Chinese composer Huang Ruo who deservedly won the adjudicators' prize and, too, the audience prize. ully justifies the project, as indeed do all the others. I was particularly taken by Lok-yin Tang's witty It is what it is !, which would be a hit anywhere. Exposure to the Chinese contemporary music scene is patchy; HuddersfieldFestival1999 was memorable for its in-depth presentation of China's new music, but exposure in London has been sporadic, to say the least. This CD, No 408 of an impressive series, is highy recommendable and the others of recent years are well worth exploring too; are they marketed outside their small country of origin?